The family was roused from sleep around 1:30 a.m. and told that they were being moved to a newer, safer location. They dressed quickly but informally. They were then led from the house where they had been staying and taken across a courtyard and down some stairs, then through a number of corridors and small dark rooms, few of which were lit. They reached a room at the end of one particular corridor that had a single electric light burning dimly. They asked for and were brought two chairs for the youngest children to sit on. The family members were then left alone for several minutes. Suddenly, a group of armed men led by Yurovsky entered the room. Yurovsky read an announcement from the local Duma explaining that they must all be killed immediately. Nicholas was utterly perplexed, and asked Yurovsky, "What? What?" Yurovsky eventually responded by saying, "This!" and shot Nicholas in the chest. Grand Duchess Catherine Mikhailovna of Russia (Russian: Екатерина Михайловна) (28 August 1827 – 12 May 1894), was the third of five daughters of Grand Duke Michael Pavlovich of Russia (youngest son of Emperor Paul I and Princess Sophie Dorothea of Württemberg) and Princess Charlotte of Württemberg (eldest child of Prince Paul of Württemberg and Princess Charlotte of Saxe-Hildburghausen). Grand Duchess Elizabeth Mikhailovna of Russia (Moscow, 26 May 1826 – Wiesbaden, 28 January 1845) was the second child and daughter of Grand Duke Mikhail Pavlovich of Russia and Princess Charlotte of Württemberg who took the name Elena Pavlovna upon her conversion to the Orthodox faith. Through her father, Elizabeth was a granddaughter of Tsar Paul I of Russia, and a niece of both Russian emperors Alexander I and Nicholas I. Grand Duchess Maria Vladimirovna of Russia (Russian: Мари́я Влади́мировна Рома́нова; born 23 December 1953 in Madrid) has been a claimant to the headship of the Imperial Family of Russia (who reigned as Emperors and Autocrats of All the Russias from 1613 to 1917) since 1992. Although she has used Grand Duchess of Russia as her title of pretence with the style Imperial Highness throughout her life, her right to do so is disputed. She is a great-great-granddaughter in the male line of Emperor Alexander II of Russia. Grand Duke George Mikhailovich of Russia (Russian: Георгий Михайлович Романов; born 13 March 1981) is the heir apparent to Maria Vladimirovna, Grand Duchess of Russia, a claimant to the disputed Headship of the Imperial Family of Russia. 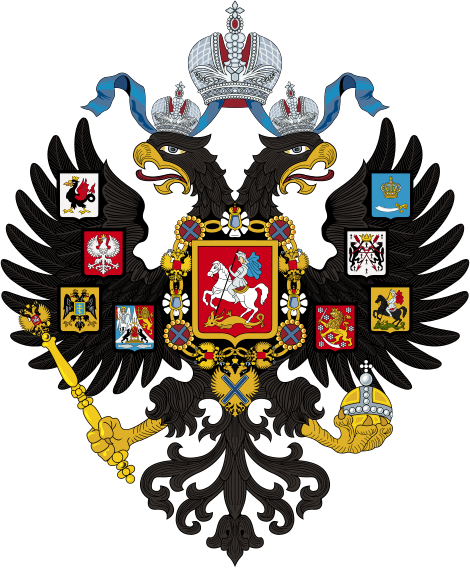 She attributes to him the title of Tsesarevich and he bears, as a title of pretence, the prefix of "Grand Duke" with the style of Imperial Highness; as a cadet member of the branch of the House of Hohenzollern which formerly ruled the German Empire and Kingdom of Prussia he is also traditionally entitled "Prince of Prussia" with the style of Royal Highness. Grand Duke Kirill (Cyril) Vladimirovich of Russia, (Russian: Кирилл Владимирович Рома́нов; Kirill Vladimirovich Romanov; 12 October [O.S. 30 September] 1876 – 12 October 1938) was a son of Grand Duke Vladimir Alexandrovich of Russia, a grandson of Emperor Alexander II and a first cousin of Nicholas II, Russia’s last Tsar. Grand Duke Kirill followed a career in the Russian navy serving during twenty years in the Naval Guards. He took part in the Russo-Japanese War, barely surviving the sinking of the battleship Petropavlovsk at Port Arthur in April 1904. In 1905, he married his paternal first cousin, Princess Victoria Melita of Saxe-Coburg and Gotha. They wed in defiance of Tsar Nicholas II prohibition. In retaliation, the Tsar stripped Kirill of his offices and honors, also initially banishing the couple from Russia. They had two daughters and settled in Paris before being allowed to visit Russia in 1909. In 1910 they moved to Russia, where Nicholas II recognized their marriage. During World War I, Grand Duke Kirill was appointed Commander of the Naval Depot of the Guards in 1915 and in 1916, he achieved the rank of rear Admiral in the Imperial Navy. During the February Revolution of 1917, Kirill marched to the Tauride Palace at the head of the Naval Guards swearing allegiance to the Russian Provisional Government. During the rule of the provisional governmental in the summer 1917, Kirill escaped to Finland where his wife gave birth to the couple's only son. In exile they lived for some years among his wife's relatives in Germany, and from the late 1920s on an estate they bought in Saint-Briac. With the execution of his cousins Tsar Nicholas II and Grand Duke Michael, Kirill assumed the headship of the Imperial Family of Russia and, as next in line to the throne as the Guardian of the Throne in 1924. Kirill proclaimed himself emperor in exile in 1926. He worked for the restoration of the monarchy from exile for the rest of his life, but his claims were contested by some factions of the monarchy movement in a division that continues until today. He wrote a book of memoirs, My Life in Russia's Service, published after his death. His granddaughter, Grand Duchess Maria Vladimirovna, is the current claimant to the headship of the House of Romanov. Mathilda-Marie Feliksovna Kschessinskaya (Polish: Matylda Maria Krzesińska, Russian: Матильда Феликсовна Кшесинская; 31 August [O.S. 19 August] 1872 – 6 December 1971; also known as Princess Romanovskaya-Krasinskaya after her marriage) was a Russian ballerina from a family of Polish origin. Her father Feliks Krzesiński and her brother both danced in St. Petersburg. She was a mistress of the future Tsar Nicholas II of Russia prior to his marriage, and later the wife of his cousin Grand Duke Andrei Vladimirovich of Russia.She was known in the West as Mathilde Kschessinska or Matilda Kshesinskaya. Michael I (Russian: Михаи́л Фёдорович Рома́нов, Mikhail Fyodorovich Romanov) (22 July [O.S. 12 July] 1596 – 23 July [O.S. 13 July] 1645) became the first Russian Tsar of the House of Romanov after the zemskiy sobor of 1613 elected him to rule the Tsardom of Russia. He was the son of Feodor Nikitich Romanov (later known as Patriarch Filaret) and of Xenia (later known as "the great nun" Martha). He was also a 1st cousin one generation removed of Feodor I (the last Rurikid Tsar) through his great-aunt (aka grand aunt) Anastasia Romanovna (his paternal grandfather's sister) thus making him a great-nephew (aka grand nephew) of hers. And through marriage, a great-nephew in-law with Tsar Ivan IV of Russia. His accession marked the end of the Time of Troubles. During his reign, Russia conquered most of Siberia, largely with the help of the Cossacks and the Stroganov family. Russia had extended to the Pacific Ocean by the end of Michael's reign. Natalya Kirillovna Naryshkina (Russian: Ната́лья Кири́лловна Нары́шкина; 1 September 1651 – 4 February 1694) was the Tsaritsa of Russia from 1671–1676 as the second spouse of Tsar Alexis I of Russia, and regent of Russia as the mother of Tsar Peter I of Russia (Peter the Great) in 1682. Nicholas Romanovich Romanov, Prince of Russia (Russian: Николай Романович Романов; 26 September 1922 – 15 September 2014) was a claimant to the headship of the House of Romanov and president of the Romanov Family Association. Although undoubtedly a descendant of Tsar Nicholas I of Russia, his claimed titles and official membership in the former Imperial House were disputed by those who maintained that his parents' marriage violated the laws of Imperial Russia. The Order of Saint Stanislaus (Polish: Order św. Stanisława Biskupa Męczennika, Russian: Орден Святого Станислава), also spelled Stanislas, was a Polish order of knighthood founded in 1765 by King Stanisław August Poniatowski of the Polish-Lithuanian Commonwealth. It remained under the Kingdom of Poland between 1765 and 1831, and was incorporated under the Russian Empire from 1831 to 1917, until the Russian revolution.Today, there are two recognized orders that claim descent from the original Order of Saint Stanislaus: the Russian dynastic Order of Saint Stanislaus (House of Romanov), awarded by the head of the House of Romanov as former sovereigns of the Russian Empire, and the Polish Order of Polonia Restituta, a governmental order of merit awarded by the President of Poland and considered by some as a type of successor. The Order of Saint Stanislaus (Polish: Order św. Stanisława, Russian: Орденъ Св. Станислава), also spelled Stanislas, is a Russian dynastic order of knighthood founded as Order of the Knights of Saint Stanislaus, Bishop and Martyr in 1765 by King Stanisław II Augustus of the Polish-Lithuanian Commonwealth. In 1831 after the downfall of the November Uprising, the order was incorporated into the Chapter of Russian Orders as part of the honours system of the Russian Empire by Emperor Nicholas I of Russia. In 1839, the Russian Order of Saint Stanislaus received new statutes, including granting status of nobility on its recipients in all three classes. As a result of the Russian Revolution 1917, activities were suspended by the Soviet Union, although it has since been awarded by the head of the Imperial House of Romanov as a dynastic order. When in 1918 Poland regained its independence as the Second Polish Republic, a Polish order was introduced as a successor to the Polish Order of Saint Stanislaus, the Order of Polonia Restituta. However, the Order of Saint Stanislas continued to be awarded after the revolution by Grand Duke Kirill Vladimirovich, Grand Duke Vladimir Kirillovich, and Grand Duchess Maria Vladimirovna; the latter recognised as the legitimate head of the pre-Revolutionary order of chivalry by International Commission on Orders of Chivalry. It has also been approved for wear with military uniform by the Russian Federation. Peter II Alexeyevich (Russian: Пётр II Алексеевич, Pyotr II Alekseyevich) (23 October [O.S. 12 October] 1715 – 30 January [O.S. 19 January] 1730) reigned as Emperor of Russia from 1727 until his death. He was the only son of Tsarevich Alexei Petrovich (son of Peter the Great by his first wife, Eudoxia Lopukhina) and of Charlotte Christine of Brunswick-Lüneburg. Prince Michael Andreevich of Russia (15 July 1920 – 22 September 2008) was a descendant of the House of Romanov which ruled Russia from 1613 to 1917. He was a great nephew of Nicholas II, the last Emperor of Russia. Prince Rostislav Rostislavovich Romanov (born 21 May 1985) is a Russian artist living and working in the U.K.. He is a member of the House of Romanov, the former ruling Russian Imperial dynasty. He is also known by the names "Rosti" and "Misha". Princess Olga Andreevna Romanoff (born 8 April 1950) is a Russian princess and descendant of the House of Romanov. She is the president of the Romanov Family Association.